Audi started production from 1993 of autos model 80, modification S2 Quattro and terminated it in 1995. This vehicle has 4 doors, the body chassis is in the form a sedan, weight 1.5 tons and length 4.5 meters, that allows a seat 5 people in sum. «80 S2 Quattro» is a full wheel drive auto with a 6-speed manual gear shift. This automobile can speed up for 6 s to 100 km/h, with a top speed of 246 km/h, owing to a 5-cylinders petrol motor with a «multipoint injection system», which generate a maximum power of 230 horsepower at 5900 rpm. Gas tank capacity of this automobile is 64 liters of petrol, thereby when mixed fuel rate is 10.1 liters per 100 km, what allow you to go about 634 km unrefuelled. The front wheels of this model have ventilated disks brakes and attached to the underframe with help of suspension «MacPherson, independent, coil springs» and equipped with anti-roll bar. Rear wheels have disks brakes and attached to the chassis with help of suspension «Double wishbone, independent, coil springs» and equipped with sway bar. Tires have the next size - 205/55ZR16. 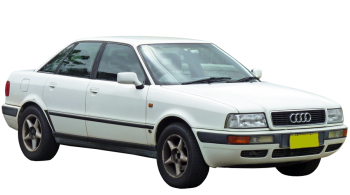 Audi 80 is not certified for crash test Euro NCAP. In addition to passive safety features (driver airbags), it is also has active systems of safety such as Traction control, ABS.